Exactly what you expect when you crave cranberry orange muffins! 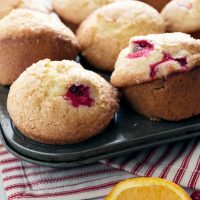 These Simply Perfect Cranberry Orange Muffins are light and fluffy, lightly sweet and chock full of fresh cranberries! Happy Saturday! 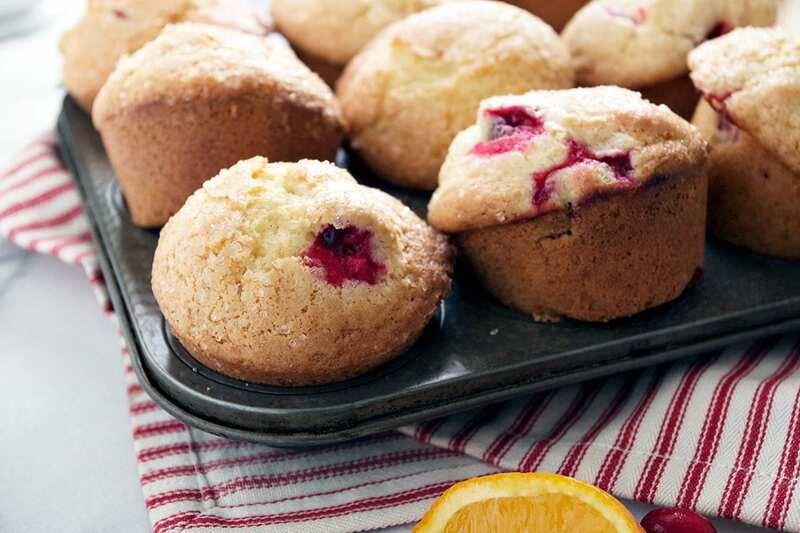 If you’re in the mood for a little weekend baking, you can’t go wrong with these Cranberry Orange Muffins. 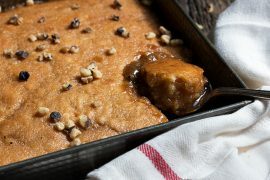 These are just the latest in a growing collection of “Simply Perfect” recipes here on Seasons and Suppers. The recipes that get this special title are my go-to recipes, that just deliver a simply perfect and satisfying result every time. 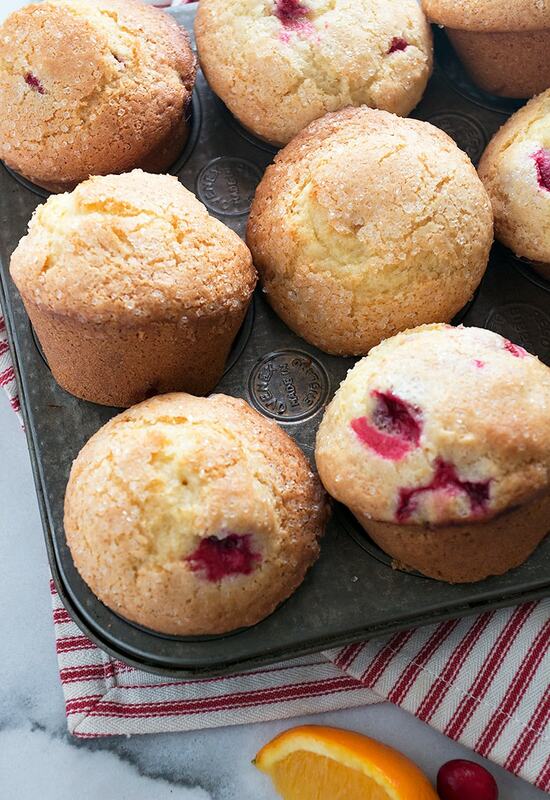 These muffins are exactly what I think of when I think of cranberry orange muffins. They are light and fluffy, chock full of fresh cranberries and lightly sweet. On top is a sprinkling of sugar, for a lovely bit of crunch. 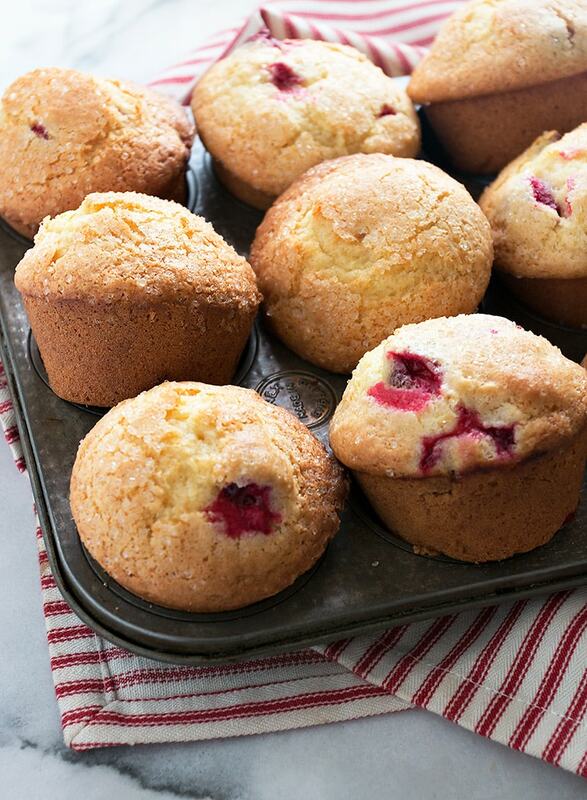 Make these muffins with either fresh or frozen cranberries. 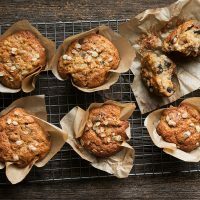 Here in Canada at least, frozen cranberries are regularly found with the frozen fruit these days, so we can enjoy these lovely muffins any time of year. The muffins shown are the large size (yield of 10). You can make them regular size by dividing the batter between 12 cups, if you prefer. Be sure you don’t overmix your batter when you add the wet ingredients to the dry. Stir just until any traces of flour disappear. You may notice that I am essentially making “homemade buttermilk” when mixing the lemon juice with the milk ahead. So yes, you could substitute buttermilk in the recipe. The reason I go this route is that it allows me to use whole milk, whereas buttermilk is just 1% base. So the lemon brings the tang of buttermilk, with a more substantial milk. You can use fresh or frozen cranberries here. If using frozen, do not thaw. Toss in 1 tsp of flour before adding to the batter to keep them from clumping together. If you have empty muffin cups, be sure to fill the empty cups 3/4 full with water before putting your muffins in the oven. This will ensure that your muffins bake evenly. If you only have dried cranberries, you can use them here (though it’s hard to replace the lovely tart fresh ones!). For dried cranberries, plump them by soaking in very hot water for 10 minutes, then drain and pat dry well. As dried cranberries are sweetened, you may wish to reduce the amount of sugar in the recipe by a few tablespoons. 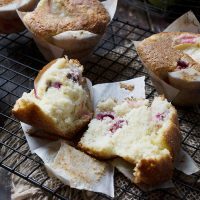 Light and fluffy muffins, that are flavoured with orange zest and juice and studded with lots of fresh cranberries. 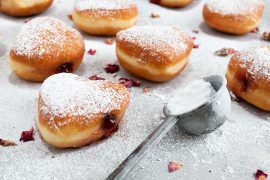 Can be made with fresh or frozen cranberries. Preheat oven to 425F (220C) Spray a 12 cup muffin tray with baking spray or line with paper liners. Set aside. Add lemon juice to milk. Stir and let stand 5 minutes. In a large bowl, whisk together well the flour, baking powder and salt. *If using frozen cranberries, do not thaw. Toss with 1 tsp flour before adding to batter. Starting with frozen cranberries will add 5-8 minutes to your baking time. In a medium bowl, whisk together the milk/lemon juice, the vegetable oil, sugar, eggs, orange juice, vanilla and orange zest. Add the wet mixture to the dry ingredients, mixing just until combined and no flour is visible. Fold in the cranberries. Divide the batter amongst the 10-12 muffin cups (10 for large muffins, 12 for regular muffins). Sprinkle tops generously with sugar. Bake at 425F (220C) for 5 minutes, then reduce the oven temp to 375F (190C) and bake for another 13-16 minutes if you started with fresh cranberries or 18-22 minutes if you started with frozen cranberries. Bake until lightly golden and a tester inserted in the middle comes out clean. Remove from oven and allow to cool in the pans. Remove from pans and store in an airtight container. Banana muffins, studded with big chunks of dark chocolate. More cranberry goodness, this time in a light vanilla muffin. It's hard to beat the combination of chocolate, banana and peanut butter. A delicious muffin! Can u make these without vanilla and orange juice? Hi Isabella, you could. I would simply increase the orange zest, replace the orange juice with equal amount of water and omit the vanilla. These are in the oven baking as i type. Wet and windy here in southern Omtario and has been for days: so bright red cramberries and orange is just what i needed brighten the day. Will have some for my boys and some my dh can take to work on the night shift tonight for the 4 am break. I doubled the cranberries and we had colored sugar for the top! They turned out perfect. So easy and I made them with 3 kids !! So glad to hear, Kathy :) Thanks! 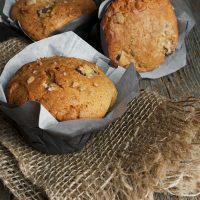 These muffins have a beautiful slight crisp on the muffin top on the outside, but are moist and sweet and delicious on the inside. It’s the perfect texture and flavour, I’m so excited! I’ve been searching for a “copycat” recipe to honour my favourite fast food muffin, the orange cranberry from McDoanlds, and I’ve finally found it! Except this is even better. Thank you!!! I love cranberry orange muffins and these are so pretty! ‘Simply perfect’ sounds accurate applied to these muffins:) And believe it or not, there were still fresh cranberries in the produce section last Monday. Have a wonderful week, Jennifer! Thanks so much, Milena and yes, I saw some at the market today, as well! Is there anything more comforting than a homemade muffin fresh from the oven? These are simply perfect! These look awesome! Just the perfect cranberry muffin, which is great this time of year. I haven’t worked much with fresh cranberries but this might be an awesome recipe to give a shot with em! Plus your directions seem very easy to follow and super thorough, thanks for sharing! I made these muffins this morning. They are indeed perfect! The taste is a great combination of sweet and tart and the texture is light and not at all heavy or oily. I used regular sugar for the top and it made a nice crackly topping. I’m thinking that next time I may toss in a handful of walnuts just because…. :-). I did have a question as to what size muffin pan you used. I have what I thought was a standard muffin pan and the recipe made 12 hefty-sized muffins (not that I’m complaining!). The tins were full to the top before baking. No problems at all as far as doneness was concerned and they are nicely golden on top, not burnt. I’m just curious. I think these would also make really nice mini-muffins. I haven’t looked at your blueberry muffin recipes but was thinking that this recipe would be a good base with lemon zest and juice instead of orange and blue berries instead of cranberries. Next time! 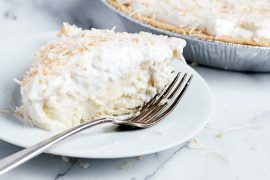 Thank you, as always, for posting such great recipes. And yes, I think you could definitely swap out blueberries and lemon in these for another great muffin! Wow Jennifer – these look absolutely perfect! That texture and color is amazing. I bet these would be good with any kind of fruit. Thank you for another outstanding recipe! They do look simply perfect Jennifer! One of my favorite kind of muffins.